The Globe guides you through activities as the Navy vessels pull into Boston Harbor for Operation Sail, from June 30 to July 5. 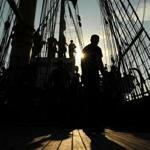 The Tall Ships returned to Boston to mark the bicentennial of the War of 1812 and the "Star-Spangled Banner." The Coast Guard cutter, one of the tall ships arriving in Boston on Saturday for Operation Sail 2012, is a symbol of a nautical past and a training vessel. When the Coast Guard cutter docks in the Bay State, it will have a trio of Mass. natives on board. For them, the visit is a chance to reunite with family and friends. Where Boston meets the harbor, there's more to see, do, and eat than ever. As the waterfront evolves, it’s adding restaurants, green space, and other attractions at a breakneck pace. Consider this your reintroduction. As part of Operation Sail 2012, high school essay contests were held in all the participating cities. This is the winning essay from Boston, chosen by the chief judge of the OpSail Essay contest, William H. White, author, historian and board member of both the USS Constitution Museum and Operation Sail, Inc.
A listing of the times and locations for events during Navy Week in Boston. Military ships from various countries will arrive in Boston on Friday, June 29, to celebrate the Fourth of July, commemorate the bicentennial of the War of 1812, and salute the USS Constitution, which fought in that war. Five majestic tall ships will join them Saturday, June 30. All ships will be open to the public at various times during the weekend and through July 5. The “White Swan” was built to train future naval officers. Its sharply raked bow and overhanging stern reduce the hull's contact with the water. The vessel carries a larger sail area than found on most ships its size. 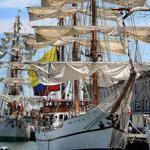 The training vessel is named after the river on which the Ecuadorian Naval School is located that was founded by the liberator of South America, Simon Bolivar. Sister ship of the Gloria. One of the biggest tall ships floating today, it flies the largest flag (60 by 43 feet) of any three-masted ship in the world. Built by the same shipbuilder that built Guayas, her sister ship. Its visit to Boston is part of a round-the-world voyage. A training vessel for naval cadets, it is the largest tall ship, and the only Barquentine class ship, in the Indonesian fleet. 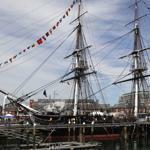 The ship, and the USS Constitution, are the only two active sailing vessels in the US Navy. Given to the US from Germany as war reparation for World War II. *Berths are subject to change.